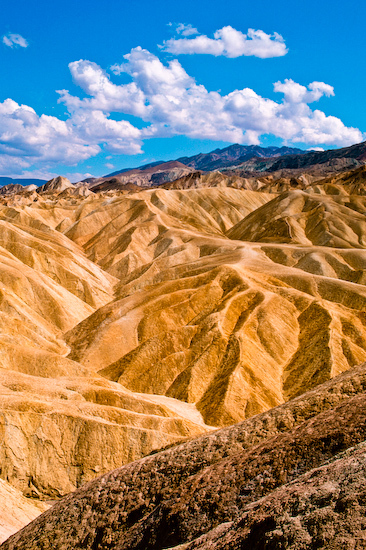 I remember hiking for several hours with my friend Jeremy through caverns, over hills, along dry river beds, and finally climbing up over these rocks to get to this location - Zabriski Point - only to find a parking lot with 5 or six cars and a dozen tourists taking pictures. I remember say something like "I thought you said the hike was the only way to get here! We could have driven here?" and Jeremy said, "I wanted you to go on the hike." Can't help smiling at that memory. What a picture! Fantastic! I received a reflex digital camera for Christmas this year, so I'm learning. I love your pictures, and the fact that you list ISO, exposure and Fnumber is helping me a lot. I also love your other web site: cooking for engineers. Thank you so much! Sorry I don't have the exposure settings on this shot. I think it was something around 1/30 to 1/60 sec exposure on f/22. As much as I love shooting digital now, I do miss Velvia. I still have my film bodies, so I might go back to shooting on slide film when I have more time and can find a good E-6 lab where I'm moving to (Austin, Texas). I used to use Calypso before they moved down to Santa Cruz.